My earliest inkling of anything to do with Afghanistan was a short story by Rabindranath Tagore titled Kabuliwala. A bittersweet story of strapping Pathan and his tender love for a little girl who reminds him of his daughter back home. 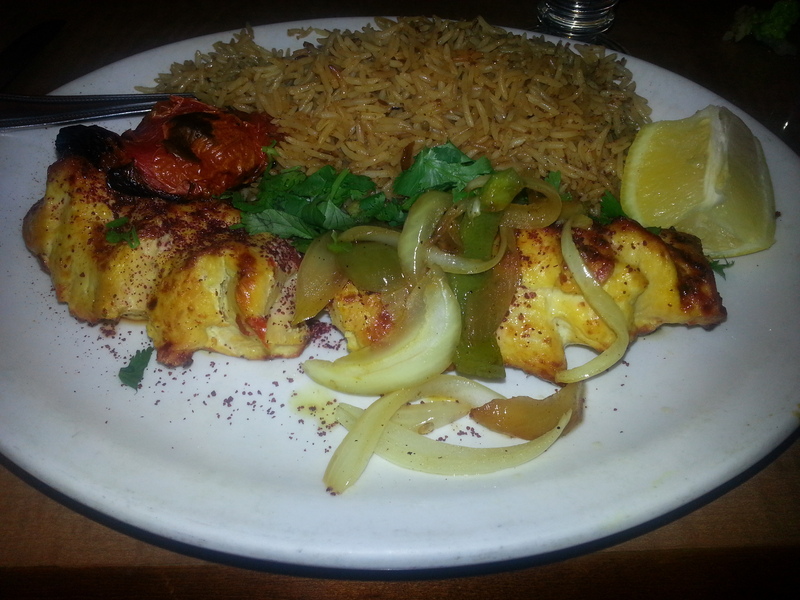 While we don’t necessarily have to venture over seven seas, oh ok ok, over the bridge to Little Kabul in Fremont to indulge, Salang Pass was however our first taste of Afghani food and one always remembers ones first Aushak no? An energized morning expedition led to rumblings of tummies and short detour to Salang Pass where we landed late afternoon but it still had a good number of folks dining in. I suppose not everyone eats at noon. Thankfully. Despite the enticing sit-down section with its tent-like drapings, lounging cushions and low tables which bring back memories of dastarkhans and deghs, our bad backs and the dated, fraying, and scruffy looking cushions kept our enticement in check. Don’t’ get me wrong, it is rather inviting but it also looks like there are many uninvited critters lurking in the folds of the Bukhara carpeting. Well there was that, and PFC nowadays pretty much zooms into a table he likes and makes himself feel at home, never mind if the table is taken. He just thinks all adults bend to his will. Note to self: straighten that bad back and stop bending to his will. Having played a neat little game of musical chairs we were finally seated. We pretty much order in five minutes flat given our penchant for the tried and tested – Bolani, Chapli Kabab and Chicken Kabab – all that served with salad and bread is more than enough to keep us going for at least two days. 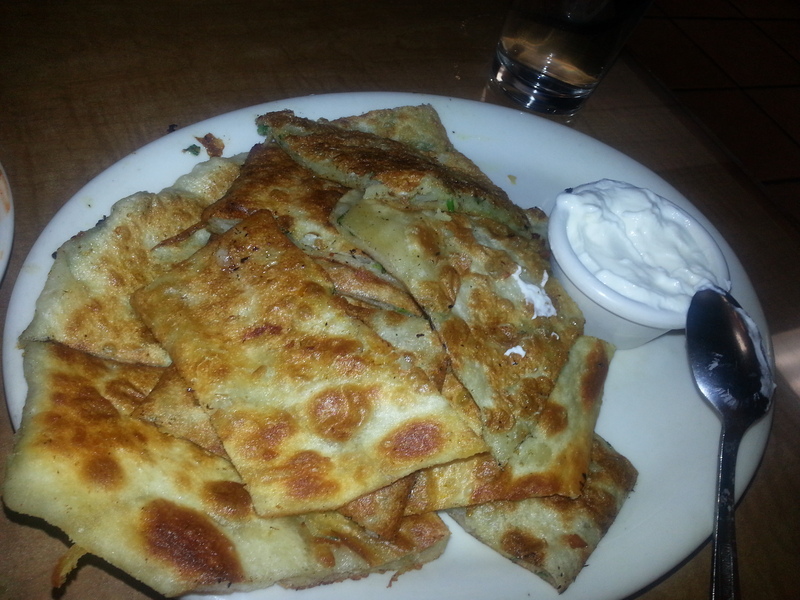 Well considering Salang Pass is incredibly generous with portions – it’s more like four. The Chapli kabab is probably their best dish with strong seasoning and a crisp exterior which I fail to replicate time and time again (I’m looking at you Shan masala) which then officially allows me to write off each trip here as ‘research’. Also personally I think it has the punch of green chillies that hint to its travels to the sub-continent. Naturally, TBH ordered this. 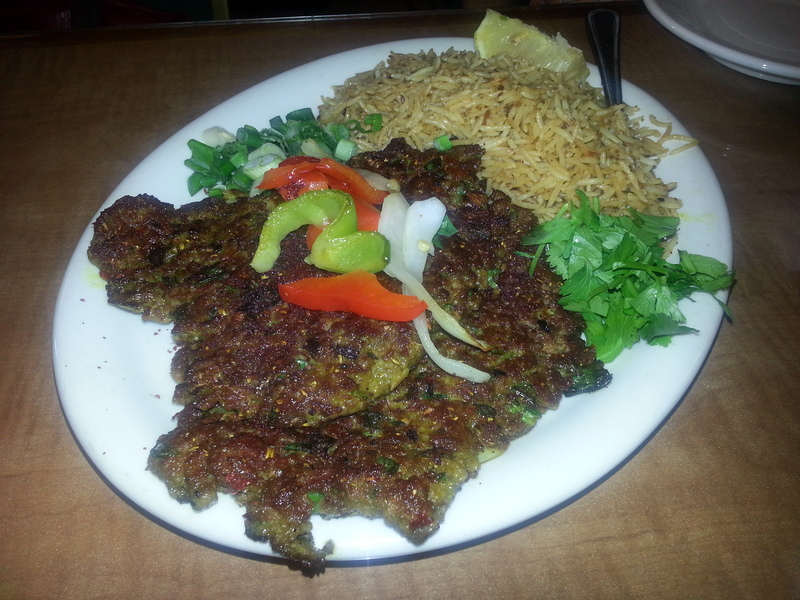 PFC and I polished off the Chicken kabab which was succulent and plentiful. Again I suspect that they are hiding some secret spice mix from us – it can’t just be onions and a few masalas that give such piquancy. Ah well, must undertake more ‘research’ trips to get to the bottom of this. Also the rice is amazingly flavourful – it might be all that butter but I can’t understand how they manage the brown colour as well as distinct zest – sumac maybe? The Bolani and rich yogurt sauce it comes with is a creamy accompaniment to this crispy rendition of an aloo paratha gone Pathan with generous filling and robust Northeastern flavours. They served us a little mountain of Bolanis which we made pretty good headway with. This is possibly as authentic as it gets save befriending a nice Afghani Aunty, and you also get to enjoy that huge somewhat kitschy mural depicting Salang Pass which is the artery that connects northern and Southern Afghanistan, as well as the famous picture of the Afghan girl. While we veer towards the kababs, the times we’ve had the Aushak which is sort of like a stuffed ravioli with beef and a yogurt sauce as well as the curries specifically the Korma Challow with tender lamb in a tomato sauce and Mantoo which is yet more beef with a yogurt sauce have been so memorable we’ve made multiple visits to recapture that flavor and never leave disappointed. The only disappointment is that we never manage to leave enough room for dessert. But then one needs a reason to return. After all research is never complete, unless you are creating new knowledge.